This purple awareness stretch bracelet fits most wrists comfortably. It has a durable stretchy band that fits snuggly around your wrist without feeling too tight. The beads are made of high quality plastic so they look and feel like crystal. A Wonderful way to show your support for the fight against Alzheimer's, Epilepsy, Pancreatic Cancer and other causes. Stretch bracelet fits most wrists comfortably. Features a 3/4" x 1/2" enamel charm. 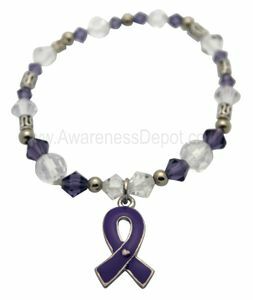 Make sure to see our full selection of Pancreatic Cancer Awareness products for more great ideas and gifts.